Aventuria by Michael Palm and Lukas Zack. 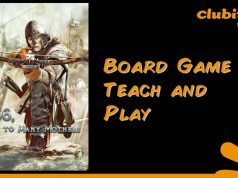 Published by Ulisses Spiele. A co-op RPG-esque game with a player versus player (PvP)/duelling mode. 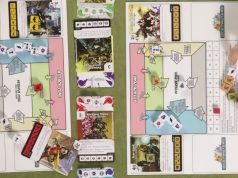 It is helpful for the readers to have a little insight into the reviewers as you will see how this shaped our opinions of the game. Both of us are board gamers and have played role-playing games. Jared plays D&D and Pokemon PTU, but Hubert has not played role-playing games for a long time. One of Hubert’s favourite games is the duelling deck building game, Hero Realms with five character expansion packs. A co-op campaign expansion is due for release in 2018. 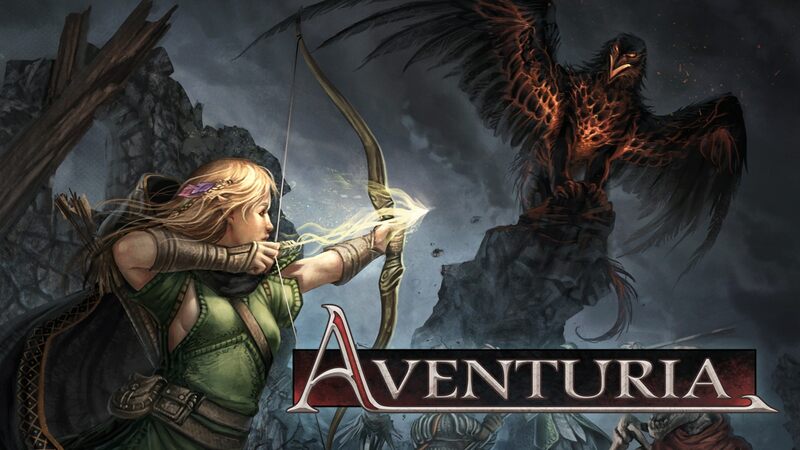 Aventuria is a fantasy game with two playing modes. The first is a duelling one where you square up against each other until one player’s health is reduced to zero. The second is co-op adventure mode. There are four adventures in the box: a short introductory one and then a three-part campaign. The game recommends playing a few rounds of PvP until you are comfortable with the main mechanisms. The campaigns then have a slightly different set-up built on top to handle the conditions of scenario. We went straight into the short adventure and did not have any issues. In the adventure, you are given a task to complete from the rule book. There are various skill feats you have to perform that change the conditions of the quest depending on whether you succeed or fail. After that, there are longer fights with the antagonist and their henchmen. Depending on the outcome, you are awarded experience points or not. Like a role-playing game, your character improves with time. You can play each quest at four different difficulties depending on how confident you are feeling, or how much of a challenge you are up for. 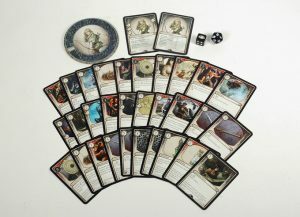 Each character has a thirty card deck, a card with their stats and another with their special power and basic equipment. 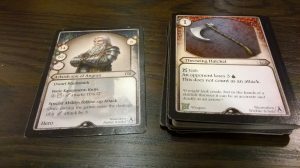 There are generic cards in them, but most of them are unique to the character’s class (dwarven fighter, human mage, half-elf thief and elven scout). You can use the cards as ‘endurance’ to allow you to take actions or play other cards. Some of the cards equip your character, others improve their stats or grant you one-off abilities like causing extra damage on a strike. This game was discovered purely because of the artwork on the cover. A more in-depth investigation followed, including watching a few YouTube playthroughs. The artwork is attractive, vibrant and beautiful throughout. The various artists are credited on the cards. The tokens are made from thick card, and the health trackers are large roundels with the character’s portrait on both sides. We loved those. The cards are of excellent stock with a linen finish. We would have liked the option to alternate the genders of the characters. From images on the Web, it does seem possible. Cards do exist. The characters also have brief backstories. Perhaps this will be developed in the future with quests? Searching for Layariel’s lost brother? The rulebook is large, well laid-out and clear with lots of illustrations. There are a few typos. The only other gripes would be that the icons on the cards are a bit small. We struggled to identify them initially. Some are clear, others are not. A person with visual impairments would require help. The cardboard insert was surplus to requirement. There were no slots for components, especially the cards. With just under 250 cards, it needed a way to stack and group them together. You could not fashion a tray and put them on their side as the box was not much taller than the width of a card. Four cardboard boxes that card sleeves are sold in solved this. Not everyone has these lying around. 80+ card plastic boxes would work as a solution. Games should come with a workable storage solution. Everything else was bagged. The dice are decent with painted grooves. The mechanics work really well together. But there is nothing that stands out about them in the game. Having pre-constructed decks is extremely appealing. You can customise them, but it hardly seems worth it. Unlike a role playing game, you do not have spend hours reading through manuals to play this game. It is a bit odd that you want to roll low for hits/feats rather than high. Players used to rolling high to hit in games like D&D will have to get used to now rolling low. Recording your endurance with cards and exhausting them was fine, but tokens could have been used instead and the cards placed in another pile. Otherwise, the game’s mechanisms worked fine. They were streamlined and easy to pick up. We did like how you can improve your character’s stats as the battle progressed. There is a lot in this box. Two different game modes. You could play two separate PvP games or team-up. The campaigns look like they will take a few evenings to play through and defeat you especially if you are playing at a harder level. You can even create parties of assailants using the ‘chance encounter’ rules. There are also expansions with more characters and campaigns. Duelling games alone are very popular. If you bought Hero Realms with the character packs and the campaign box, it would cost more than Aventuria. With the high replayability and quality components this scores very high. The only let down is having to come up storage solution for the cards. You would not want those to be damaged. They are far too nice. We were very happy with the theme. The character decks are thematic. During our game, the thief was able to retaliate after he had been struck a blow by playing a card that enabled him to stab his assailant back with a hidden dagger. You do feel like you are on quest trying to solve problems and fight antagonists. There was one thematic disconnect. In our game, the elf scout relied mostly on bow attacks. An archer would stand back to be effective, away from melee combat, yet she was hit by melee weapon that should have been out of range. Plus, a bow is a two-handed weapon. You would not be able to use a melee attack during the same turn. We found this a bit odd, and would have liked some alternative rules or dice outcomes to facilitate or prevent certain melee with ranged combat. This game is pretty easy to set-up and packs down especially the duelling mode. The campaigns require a bit more. The game does not take up much table space. It does not sprawl. Ulisses Spiele sent us a few plastic tokens and A3 paper player mats. You need that much space per player plus a bit for the antagonists. The game is engaging. There was a sense of victory when we dispatched an opponent and won. There was also a concern when Layariel’s health was low. There is a co-op feel to the campaigns. You can help each other out by passing overhealing potions, passing over favour tokens or playing other cards to help them. This game is excellent if you want the feel of a role-playing game without the time commitment. You are not going to have the issue of creating a character that dies during their first adventure. There are no charts to wade through to see if your strike was successful. Everything is on cards and easy to find. 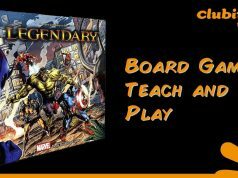 Many thanks to Ulisses Spiele for providing this game, the player mats and plastic tokens for review. If you like this review or have played Aventuria let us know what you think of the game, please leave a comment below.